Spring brings all kinds of fun things, including planting gardens … which for me always brings to mind the farm. So this week stay tuned to get two awesome, cute, & fun farm animals. This chicken is super cute, super easy, and you’ll love it so much you will make a whole brood of chickens! Make them in dozens of colors and sizes and have some fun with this DIY polymer clay chicken figurine. Start by gathering the polymer clay you need: white, yellow, orange, and red. Condition all your polymer clay pieces. Choose a lump of yellow clay, about the size of a walnut, and run it through the pasta machine. Cut out two teardrop shapes using a small Kemper cutter. Roll the remaining clay into a cone shape and invert it upside down for your basic chicken shape. Add the two teardrops to the sides of the chicken as wings. Roll your orange clay through the pasta machine on a medium setting (about a 5). Cut out three star shapes (two for feet and one for his beak) using your Kemper cutters. Attach the orange feet to the bottom of the chicken and press tightly to secure them to the chicken. Now decorate the chickens face using a “splotch” of white behind the eyes, red eyebrows & gobbler, as well as two black seed beads for eyes. Bake at 265 degrees for 45-60 minutes covered in foil. Sign up for my email list to get more FREE tutorials in your email bi-weekly. Now what could have been more fun than that? Join me later this week for another free polymer clay tutorial. 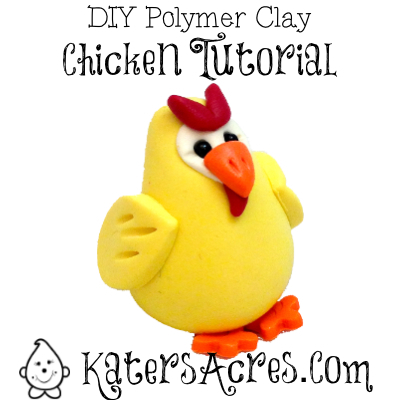 I hope you liked this polymer clay chicken tutorial, please be sure to leave your comments below. I am so behind on visiting, but this is super adorable! Thanks!